The Ladies’ Monthly Magazine, 1869. On the Shores of Bognor Regis by A. M. Rossi, 1887. 1827 Seaside Costume, Ackermann’s Fashion Plate. 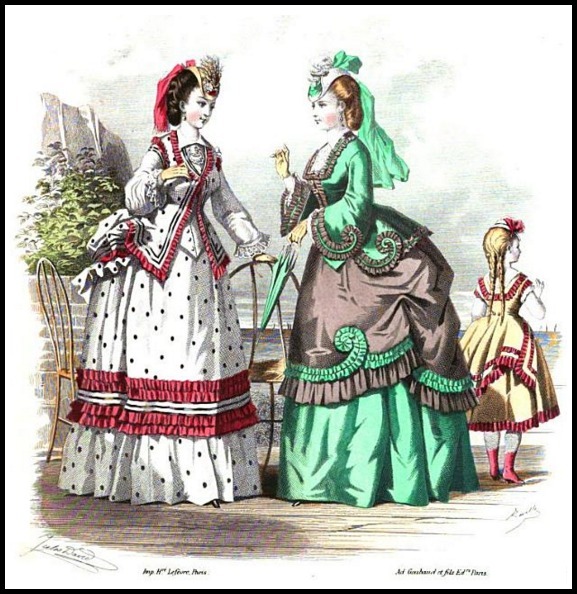 In the Regency era and into the 1820s and 1830s, seaside dresses were often quite similar to walking dresses. They were made in light fabrics, such as cambric or muslin, and worn with pelisses made of light-colored cambric, jacconet muslin, or silk. Straw hats, leghorn bonnets, and veils that covered part or the whole of the face were also quite popular at the seaside, as were parasols for shielding a lady’s complexion from the summer sun. 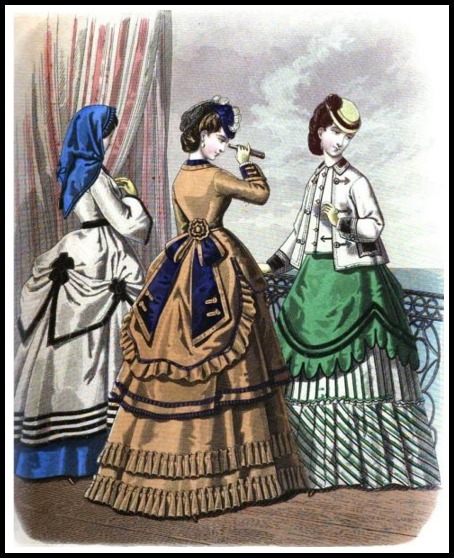 In the below image, you can see a cotton seaside dress from the 1860s. Note that though the shape of the skirt and jacket remain in line with that of the popular, large-skirted fashions of the 1850s and 1860s, the cut is looser and the gown is fairly plain. 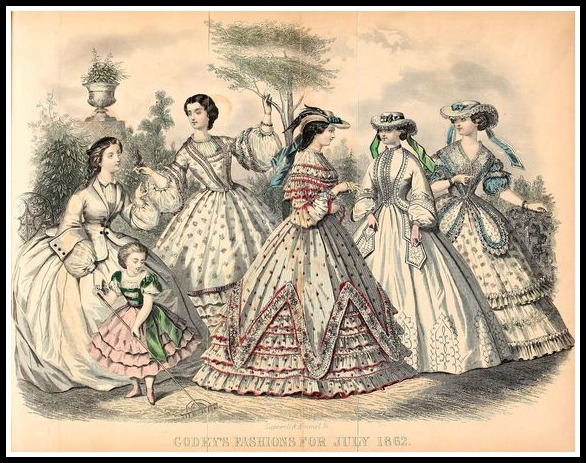 Fashions for July 1862, Godey’s Lady’s Book. 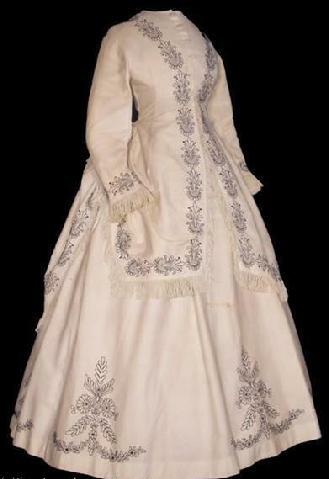 Here is another example of the popular style of 1860s white cotton seaside dress trimmed or embroidered with a darker color. This seaside ensemble is comprised of a skirt, bodice, and jacket made of cotton. The flat-crowned straw hat in this image is from the 1870s and is trimmed with seashells. By the late 1860s, the silhouette of ladies’ gowns was beginning to change. Fabric that had once been draped over enormous wire crinolines was now being drawn to the back and draped over a bustle. Seaside costumes were not immune to this metamorphosis. 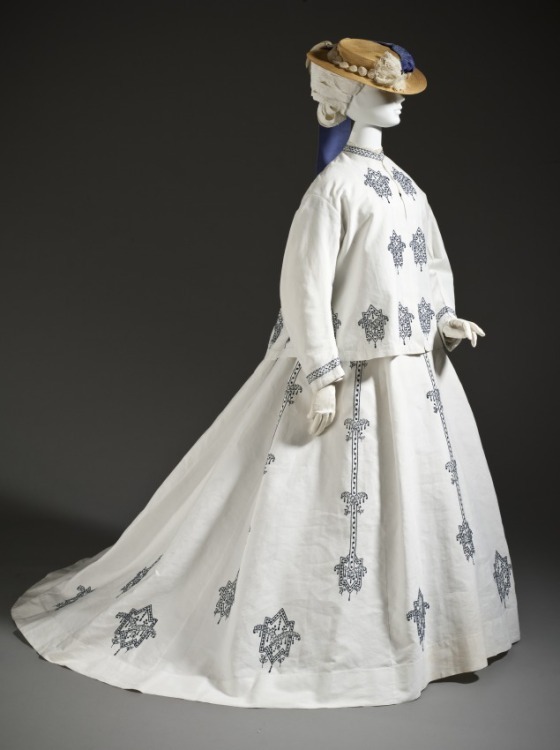 Still, seaside gowns managed to remain distinguishable from morning gowns, walking gowns, and other dresses mainly by virtue of the fabric used—cotton piqués, cashmere, or wool—and the simplicity of their trimmings. Below is a late 1860s seaside ensemble made of wool. Note that despite the gradual change in shape from the large-skirted seaside gowns of the early 1860s, this gown still appears relatively loose-fitting. 1864-1868 American Wool Seaside Ensemble. 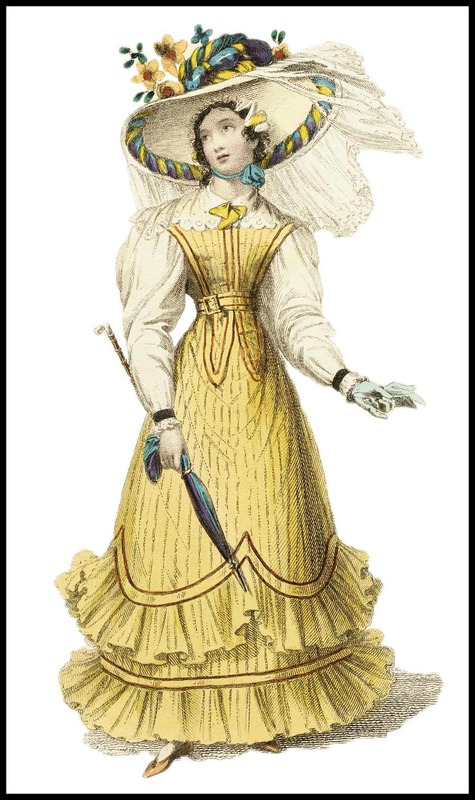 Seaside Costume with Capeline, Ladies Monthly Magazine, 1869. Though fashion magazines depicted seaside costumes in bright, contrast colors, seaside dresses of white or tea-colored cotton with black embroidery remained very popular throughout the decade and well into the next. Below is a lovely example from 1869. 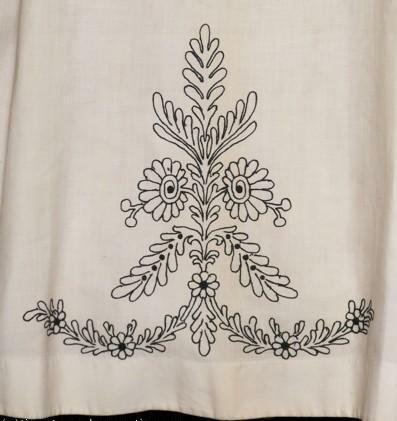 This two-piece seaside ensemble from The Bartos Collection (who have kindly given me permission to use the following images) is made of corded cotton that has been embroidered in black and trimmed in silk fringe. 1868 Embroidered Seaside Bustle Dress. 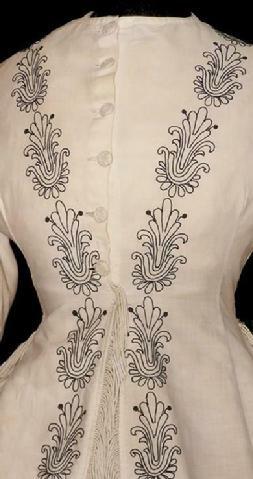 1868 Fabric Close-Up Embroidered Seaside Bustle Dress. Seaside Costume, Milliner and Dressmaker and Warehouseman’s Gazette, 1870. As mentioned above, not all 1870s seaside dresses were brightly colored or made of whimsically patterned silk. In fact, many seaside costumes continued to be made in some version of light colored cotton or wool that was trimmed, embroidered, or printed in black. 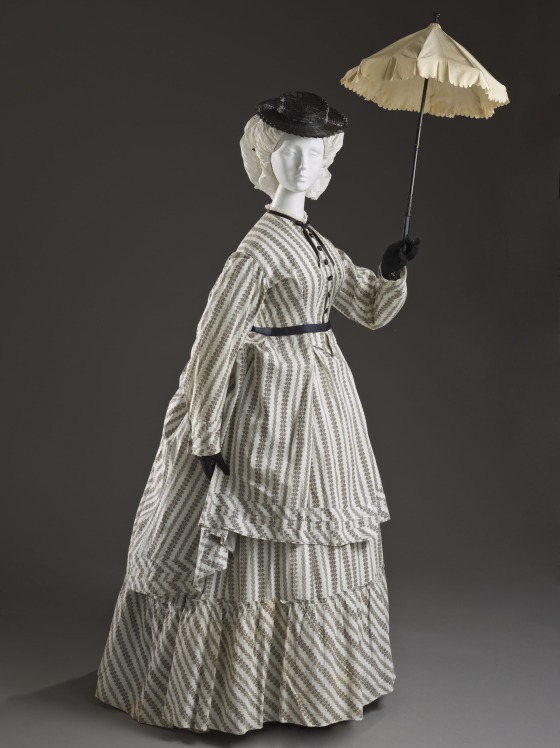 Below is an 1870 seaside ensemble made of printed cotton. It consists of an overdress and a petticoat. 1870 Printed Cotton Seaside Ensemble. The skirts of seaside dresses were usually shorter—with a hemline at or above the ankle—for ease of movement. The below image of an 1872 seaside dress shows the length of the hemline in comparison to the mannequin’s boots quite clearly. Notice the style and color of this particular seaside ensemble. According to the Victoria and Albert Museum, the style of this gown was inspired by the colors and stripes in a British sailor’s uniform. Sailor inspired seaside dresses would become very popular toward the end of the century. 1872 British Cotton Seaside Costume. 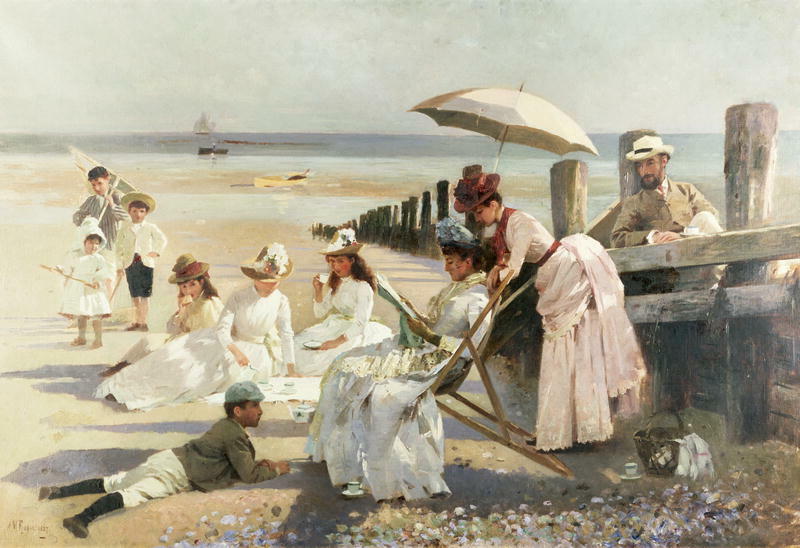 The availability of more “beach friendly” fabrics did not affect the popularity of cotton, which continued to be used for seaside costumes throughout the 19th century. 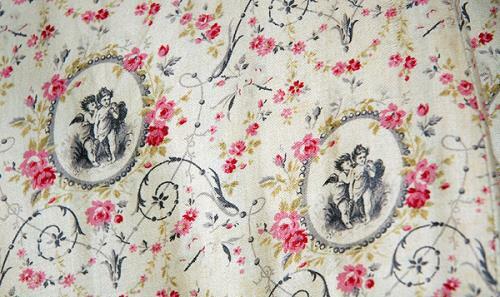 For example, the 1878-1880 seaside dress below is made of cotton sateen printed with pink roses and cupids. The narrow skirt and bodice of this dress is very much in keeping with the fashionable silhouette of the 1880s. 1878-1880 Printed Cotton Seaside Dress. 1878-1880 Fabric Close-Up of Printed Cotton Sateen Seaside Dress . By the end of the 1880s, seaside costumes were even tighter and narrower than ever. An 1888 edition of the Woman’s World Magazine describes them as “sheath-like seaside costumes that cling to the figure” like an “outer skin.” These tight-fitting seaside dresses gave way to the popular middy blouses (blouses with a sailor collar) and flared skirts of the 1890s. 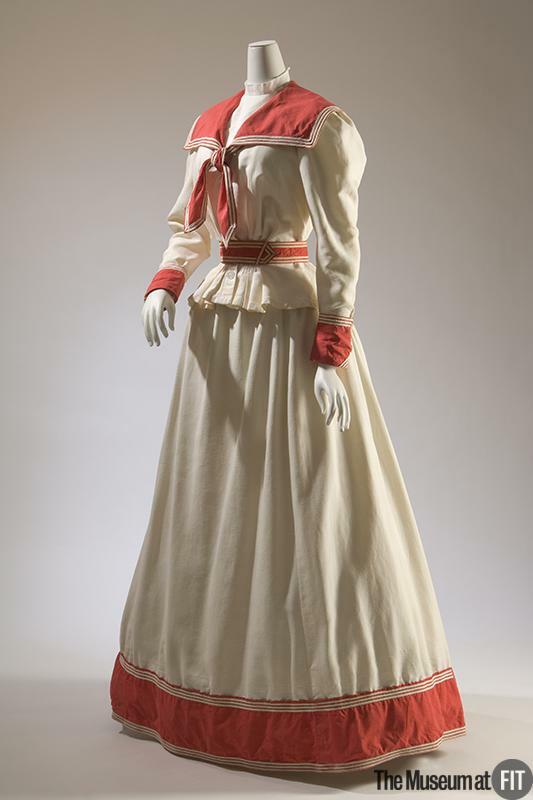 Below is an 1895 cotton piqué seaside dress comprised of a middy blouse and skirt. 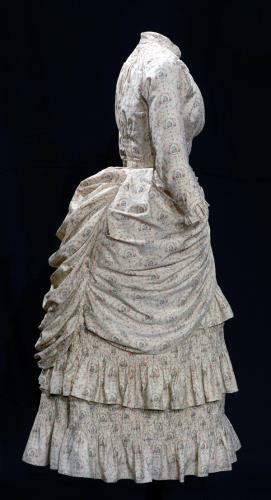 1895 Cotton Piqué Seaside Dress. 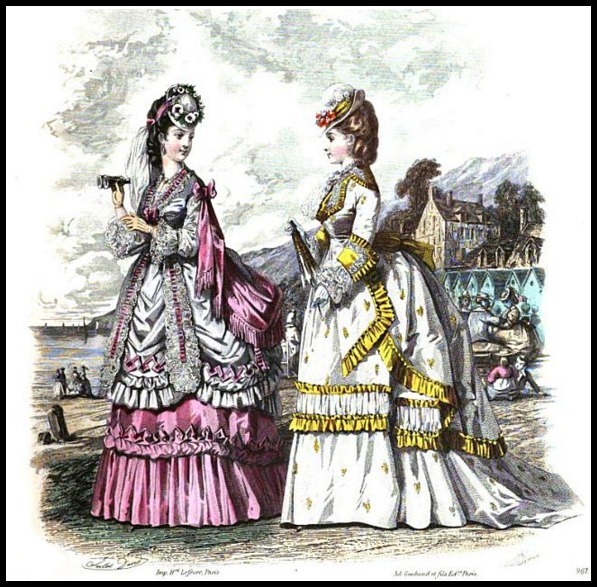 With so many people drawn to the seaside each year, it is no wonder that ladies in the Regency and Victorian eras took such an interest in seaside fashions. I hope the above information and images have given you some little idea of what these ladies might choose to wear on their seaside holidays. 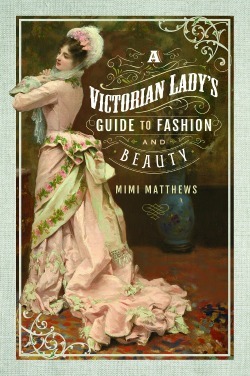 *Author’s Note: This article is excerpted from A Victorian Lady’s Guide to Fashion and Beauty, coming July 2018 from Pen and Sword Books. Belle Assemblée: Or, Court and Fashionable Magazine. London: J. Bell, 1824. Delineator. Vol. LVIII. London: Butterick Publishing Co., 1901. Godey’s Lady’s Book. Vol. 65. Philadelphia: Louis A. Godey, 1862. Godey’s Lady’s Book. Vol. 94. Philadelphia: Louis A. Godey, 1877. Ladies’ Monthly Magazine: The World of Fashion. London: Simpkin, Marshall, & Co., 1869. “London by the Sea.” The Speaker. Vol. 20. London: Mather & Crowther, 1899. Milliner and Dressmaker and Warehouseman’s Gazette. London: Adolphe Goubaud, 1870. “Our Costumier.” Once a Month. Vol. IV. London: Griffith, Farran, & Co., 1886. Woman’s World. Volumes 1-2. London: Cassell & Company, 1888. I remember my mum wearing a hat and high heels to the beach in the 1950s. It used to be so much dressier! Beautiful gowns! Such elegant dresses and I love the hat with seashells. I think so too :) That hat and gown ensemble is one of my favorites! I love the dress that has the seashell hat. So pretty! Me too :) And it looks so beachy and comfortable! And that embroidery, at least I think it is embroidery, is beautiful too. But I like the relaxed shape. Love it! Wow, check out the details in the back of the embroidery dress from the Batos collection. It is beautiful and it does well with marine environment or should I say navy? :) . Isn’t it gorgeous? The cotton fabrics with embroidery look very wearable to me. As warm weather approaches, my thoughts turn to the seashore and our week at our timeshare on the beach. So this wonderful article caught my eye. The beach has apparently always been a place to see and be seen, especially in such beautiful couture. How I wish people still dressed like this at the beach! I love the elegant femininity. 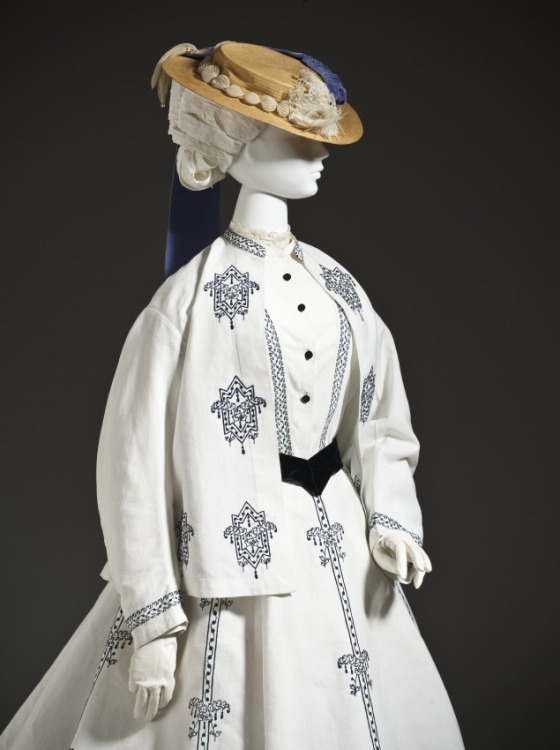 Of the ensembles you featured, my favorite is the 1895 Cotton Piqué Seaside Dress with the sailor collar. I would wear that to the beach in a heartbeat! I agree, Angela :) And it wasn’t so long ago that people still dressed to go to the beach. I’ve seen images from the 1940s and 1950s of lady’s in belted dresses, big hats, and spectator pumps walking down the boardwalk at beach resorts here in the U.S. Probably not super comfortable, but so very fashionable!